The Heart Goes Last isn’t as great a read as Oryx and Crake or The Robber Bride, and it’s not going to be a formative reading experience for me the way The Handmaid’s Tale or The Edible Woman were. And it’s not as meticulously excellent and perfectly curated as Atwood’s most recent story collection, Stone Mattress. Even still, The Heart Goes Last is something special, because I honestly believe that’s the only kind of work Margaret Atwood is capable of producing. The story follows Stan and Charmaine, a down-on-their-luck couple who are just one couple of millions that are trying to scrape by in the wake of an economic disaster. Charmaine waits tables at a sort of frightening bar, and they’re living together in their car when they hear about a new opportunity that sounds, frankly, too good to be true, but still a damn sight better than having to guard their car and move around daily in order to avoid marauding looters and rapists. The basic gist of the Positron project is this: they will join a new sort of large scale intentional community where they will spend half their time living in a [pretty comfortable] prison (Positron) and the other half living in an idyllic town (Consilience) where they will have their own home, jobs, food, and security. In either place, they will be provided for and protected from the ongoing economic crisis in the outside world. Obviously, things are not as they seem, and the majority of the book deals with how Stan and Charmaine learn exactly how much they’ve screwed up and then how they try with mixed success to extricate themselves from a pretty messed up predicament. 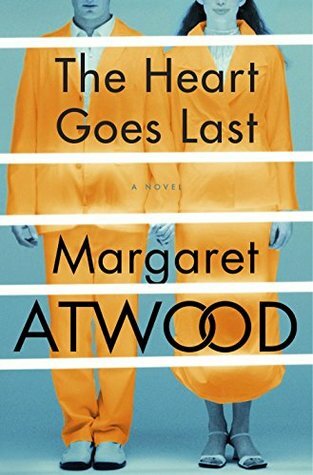 It’s tempting to compare The Heart Goes Last to Atwood’s earlier dystopian work, and there are some similarities. With The Handmaid’s Tale, it shares its examination of gender and sexuality in a strictly planned and regimented society. With the MaddAddam books, it shares concerns about corporatism and other evils of late stage capitalism. However, Positron/Consilience is a sort of kitschy post-postmodern paradise that lacks the darkness and grit of either the Republic of Gilead or the MaddAddam trilogy. And where neither The Handmaid’s Tale nor MaddAddam were devoid of Atwood’s signature wry humor, in The Heart Goes Last we’re treated to a sort of ever-present tongue in cheek sarcasm with high camp stylings. I feel like The Heart Goes Last needs to be adapted to film by John Waters. Or perhaps Richard O’Brien. Or both. I think it could work. In any case, it’s a funny, funny book that is also weird as hell, and it has a core of tragedy that, as someone who has struggled economically in recent years (although I never did have to live in my car), I found sometimes a little too relatable. There was no point in the book where I just though “this is too absurd; I don’t believe this.” I mean, sure, some weird things happen, but the sort of absurd situational humor that Atwood employs retains just enough realism that I always felt like Stan and Charmaine could be real people. Their extreme ordinariness is a big part of the humor, but they’re never boring or banal. Instead I find the characters’ normalcy comforting, and it helps to ground a story that has enough bizarre details that it could easily be driven off the rails by its own silliness. The Heart Goes Last isn’t a great Margaret Atwood novel, possibly due in part to its odd genesis (it began as a serial work on now-defunct Byliner). There are definitely places, mostly in the beginning, where it reads more like a set of loosely related vignettes about the same characters. It doesn’t start to feel like a proper novel in its own right until somewhere after the first third. The thing is, “not a great Atwood novel” is still a distinct cut above most everything else being published. I wouldn’t recommend The Heart Goes Last to someone just discovering the author, but if you already love Margaret Atwood, you’ll want to read it.